Supporters of Hillary Clinton and Donald Trump disagree on whether to support or oppose expanding the production of a range of fossil fuel energy sources, according to a new Pew Research Center analysis. Most Trump supporters favor increased production from coal mining, fracking or offshore oil and gas drilling, while most Clinton supporters oppose expanding the use of these sources. There was only one question posed on issues related to climate and energy in this year’s three presidential debates and the vice presidential debate. But just as Trump and Clinton have stark differences on energy policy, so too do their supporters. The largest difference between Clinton and Trump supporters is over expanding coal mining. About seven-in-ten (69%) of Trump supporters favor more coal mining, while 30% oppose it. 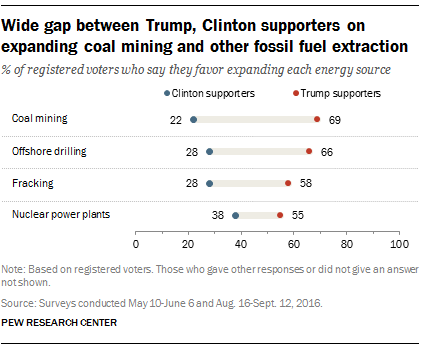 In contrast, only 22% of Clinton supporters favor expanding coal mining, a difference of 47 percentage points between the two groups of voters. Roughly three-quarters (76%) of Clinton supporters oppose more coal mining. Trump supporters are also far more likely than Clinton supporters to favor more offshore oil and gas drilling (66% vs. 28%) and hydraulic fracturing for oil and natural gas (58% vs. 28%). These differences are in keeping with candidate positions on coal: Trump has promised to revive the coal industry, while Clinton has promised to phase out reliance on fossil fuel energies and expand renewable energy production, such as wind and solar power. Differences between each candidate’s supporters are broadly in line with a recent Pew Research Center report that shows deep partisan divisions on energy issues and views of climate change. One area of agreement between Clinton and Trump supporters is expanding both solar and wind energy sources. 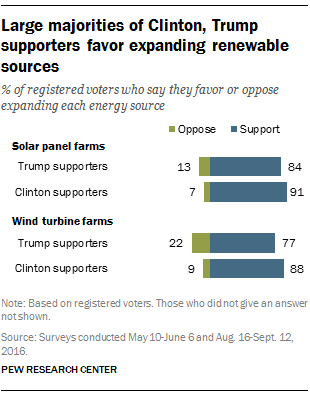 About nine-in-ten Clinton supporters (91%) and 84% of Trump supporters say they favor more solar panel farms. Roughly similar shares of Clinton supporters (88%) and Trump supporters (77%) support more wind turbine farms. But past Pew Research Center surveys have found Democrats are more likely than Republicans to prioritize development of alternative energy sources over fossil fuel development. Note: These findings are based on 1,324 registered voters (including 582 Clinton supporters and 488 Trump supporters) on the Pew Research Center’s American Trends Panel who completed both a survey on presidential vote support conducted Aug. 16-Sept. 12, 2016, and a survey on beliefs about climate May 10-June 6, 2016. The margin of sampling error for all registered voters is plus or minus 4.4 percentage points; for Clinton supporters it is plus or minus 6.9 percentage points, and for Trump supporters it is plus or minus 7.2 percentage points.